Metallica were to play two shows in March in Sweden this year, but after the first show, James Hetfield got food-poisoned and couldn’t get well in time to perform the second night. I had tickets to that second gig, and it was a huge disappointment when the rest of the band came on stage and announced the cancelled show. The show last night was rescheduled from March, and I get it, people get sick, so Metallica could just have told the fans they’re sorry and that would have been cool. But, they really stepped up! 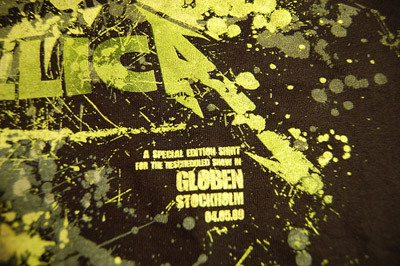 The Globe area was filled, 16 531 people, which I believe is a new audience record, and everyone attending got a custom made t-shirt stating that it was exclusively for this rescheduled show. 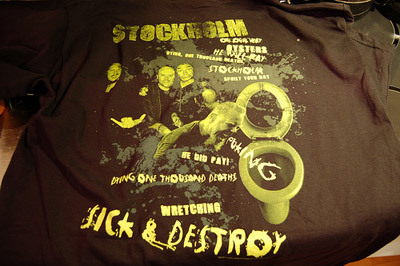 Stockholm – on our way. On top of that, everyone also got a free download of the entire show last night (Metallica record all their live shows) to listen to it afterwards. I have to say I’m really impressed by this, and I think it’s a great way for Metallica to show they’re sorry and sincerely want to make up for it to their fans! There were two opening acts, and if you ask me that is almost always one too many. I didn’t see the first one, The Sword, and only got a couple of glimpses of the second one, Machine Head. Machine Head’s bass player, by the way, had to go and do an emergency root canal, so the bass player in Swedish band The Haunted filled in for him. Can’t say I’m really a fan of Machine Head, or, well, rather just indifferent about them. They did play a cover of Iron Maiden’s Hallowed Be Thy Name, though, and that was nice. 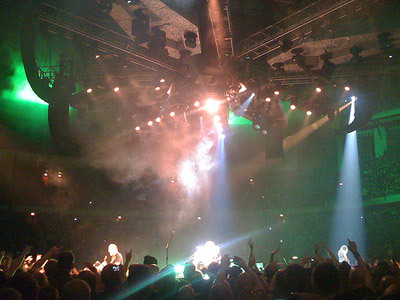 At around a quarter after nine in the evening, Metallica got up on stage and the crowd, naturally, went wild. I’m sure I have told you before, I’m a very active concert goer and I love going crazy down on the floor. Within a few songs, I had reached the fence, and was very very close to the actual stage. 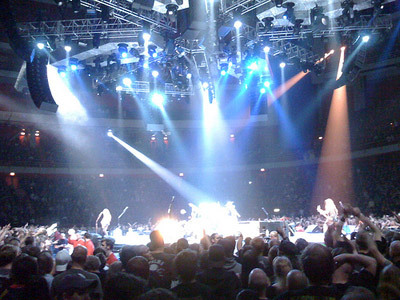 In regards to the stage, Metallica have their stage in the middle of the arena, so they’re completely surrounded by the audience all around. This means that everyone get closer to the stage, and if you’re on the floor, a lot more people get the chance to stand very close to any of the band members. The stage is also only about two meters up, so it’s not like those festival stages that are up there in the clouds. Another nice thing is that the drummer get to be part of the show, and not just hidden away in the back. The centered stage has its cons too, though. When a band member is close to you, it’s awesome and everyone’s very happy, but there are times when no band member is present and you can’t even see all of them (because they might be on the opposite side of the drum set or just very far away on the other edge) – and if this happens in a new song/less interesting part, it becomes so obviously stale and less fun then. So, I don’t know. Half of me loves the centered stage, half of me thinks it becomes too much of a mix between lows and highs. It was, I think, the 8th time I saw Metallica live (first time was almost 17 years ago) and they never fail to deliver. Last night, though, I have to say that it was good, but not fantastic. And it’s not because of the band, because they seemed hungry to finally play this show, and Hetfield really seemed happy. 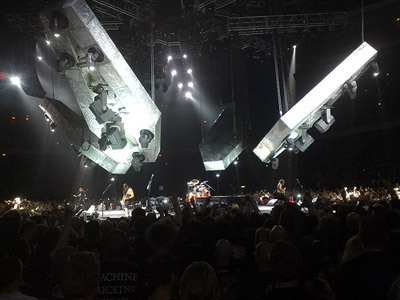 The stage set-up was great, too; very nice light show, very hot fire columns (no explosions, though) and coffin shaped spotlight holders hoisted up and down. The sound was a bit off in the beginning, at least where I stood, but it gradually got better. But what it fell on, I’d say, is that the new songs, in my book at least, doesn’t cut it – especially live. And when 6 out of 18 songs are from the last album, it definitely loses tempo as well as audience attention. And yes, I know, naturally they want and need to play new stuff as well to motivate themselves, but that makes the show as a whole an uneven experience. In a scale from 1 to 5, with 5 being the best, I think I’d rate this show a 3. During the last song, inflated balls were raining from the ceiling, and the audience were tossing them around all over the place – they also landed on the stage and the band were kicking them out again. And, at the end, lucky me managed to get a hold of a ball to bring home! And as if that wasn’t enough, I finally managed to get a guitar pick as well! Previously, I have gotten guitar picks from Iron Maiden (Dave Murray – on two occasions! 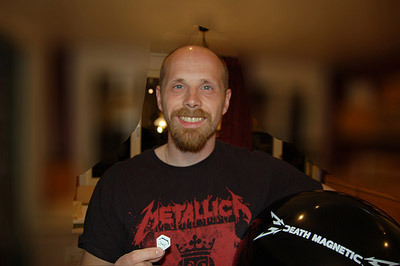 ), Black Sabbath (Tony Iommi) and Alice Cooper but at last, I now also have one from Metallica!